11 Sept – Please note that the walk from both sides is now fully booked. 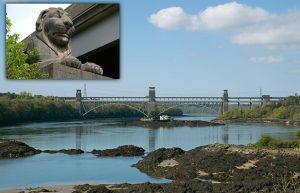 Take a walk with Menai Heritage to view to hidden Britannia Bridge lions! The sculptures once flanked the entrance to the tubular bridge, but now lie below the road deck, seldom seen. Our qualified tour guides will be leading walking tours to the base of the Britannia Bridge, where the impressive structure of the bridge can be appreciated, and where you can see the magnificent lion sculptures. You will learn about the history of the bridge and how it was constructed, as well as general information about the Menai Strait. Visitors to the Anglesey side will need to walk a short distance to the bridge. A somewhat longer walk will also take place on the Gwynedd side, from near Treborth village. The walks will mostly on the level on unpaved roads or paths, but some parts will be on a steep slope or down steps to a rocky seashore. FREE. Booking essential – limited space. Book your place by contacting us at info@menaiheritage.org.uk or 01248 715046. Please specify whether you want morning (10:30) or afternoon (14:30), and your choice of the Anglesey or Gwynedd side walks.